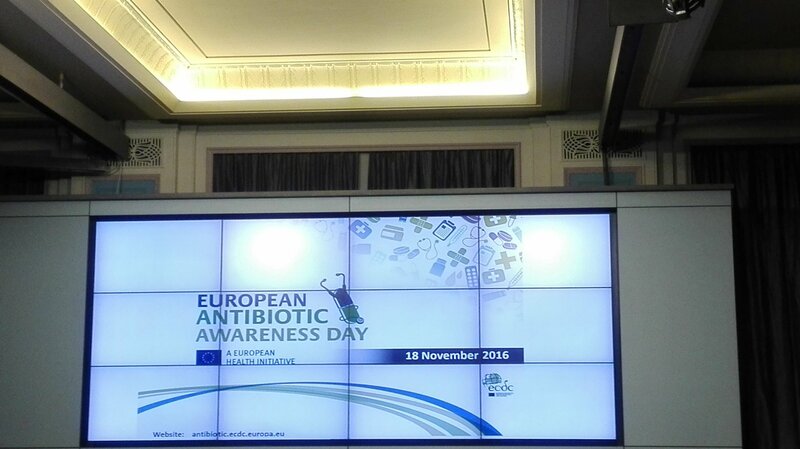 On 18 November, Aleksandra Sanak, CED Senior Policy Officer, and Cecilia Prunas, CED Communications Officer, attended the press event organised by ECDC (European Centre for Disease Prevention and Control) on European Antibiotic Awareness Day. As a partner of ECDC, once again the CED reaffirmed its commitment to promote the EAAD 2016 campaign that, this year, focuses on promoting a wise and prudent use of antibiotics in hospitals. During the event, CED Representatives participated in the live Twitter chat (#EAAD2016) and read the CED statement prepared by Susie Sanderson, Chair of CED Board Task Force Antibiotics. The CED continues to raise awareness about prudent use of antibiotics to its members and their patients and we can see a positive move to appreciation of the issues over the last years. Although it is not easy to evaluate the changes in prescribing approaches in dentistry in Europe, dentists and their teams are much more conscious about the reasons to contribute to the reduction of AMR. We will continue to promote messages that encourage both patients and clinicians to appreciate that appropriate prescribing in dentistry is intrinsically linked to the provision of a range of clinical interventions in the management of dental infections. Furthermore, CED released its video pledge to celebrate the European Antibiotic Awareness Day, in which, Dr Susie Sanderson recalls the importance of prudent use of antibiotics. The video was prepared together with the British Dental Association and is available here.